With all of the doom and gloom in the racing industry Saratoga was a definite bright spot. It seems like both summer (Del mar is the other) boutique meets had better than expected numbers; these are signs that fan interest is focusing on the better racing even has marginal racino tracks raise purses. These numbers lend credence to the opinion that it is time for racing to eliminate marginal content. The highlights of the meet was of course Rachel Alexandra who surely minted a few thousand new racing fans this summer. Even the most obtuse horseplayers who could care less about equine achievements were moved by Rachel's stirring victory in the Woodward. The year of the female in racing certainly continued at Saratoga. Not only were most of the notable performances by fillies and mares but a female claimed the training title of the first time. Linda Rice dominated the turf sprint races as she had entry after entry run one big race after another. Careless Jewel ran a tremendous race in the Alabama, especially considering her wild pre-race antics. Icon Project projected her speed in the Personal Ensign with a break-out 13 length tour de force. Of course the highlight of the meet was Rachel Alexandra, so much has been written about her but her greatest achievement is in illuminating the appeal of horse racing to new fans. Saratoga proved to be the perfect venue for Rachel to run her greatest race. A house packed with old and new fans and she "raised the rafters"giving people a memory that they will never forget. There are two need the lead types in here and one is sporting a bar show while the other is going to model an aluminum pad. My policy has always been to toss horses wearing therapeutic horse shoes and except for a few exceptions it has worked out well over the years. My other opinion here is that there is going to be a "big race day" speed favoring track out there. So from right off the pace D' Wild Affair should be able to pass the need the leads after stalking and hold on for the win and about 8-1. Fresh and ready to win. The key issue affecting the racing product is the sheer amount of the product. On any given Saturday in North America there are upwards of two dozens tracks operating with a race commencing every minute. With this much product racing ceases to be an event and resembles an infomercial for a kitchen appliance on a never ending loop in a deserted big box store that nobody goes to in some anonymous blanched suburb. Go to any simulcast center or OTB and every race looks the same. In silence it is anonymous claimers running around in a circle, while older working class men yell and slap their behinds with the racing form. Instead of a complex blood and guts puzzle to contemplate the game is reduced to keno with domesticated animals. Racing does not need to reinvent the wheel to bring back the big-event nature of the game. The white hot and trendy UFC only holds fights every few weeks. Thus every fight is hotly anticipated as a lack of supply stokes demand. Anticipation is marginalized when in a three minute span the 5th race from Finger Lakes is shortly followed by the 5th from Delaware which is followed by the 4th from Ellis. This is where government intervention has damaged the collective racing product. The permission to subsidize purses with slot machine revenue has created entirely too much product. Racing has ceased to be a hobby of the wealthy and has become welfare for horsemen. While everyone deserves to be paid for their hard work they should not be subsidized when their work no longer has a market. Should neighborhood shoe repair stores be brought back from the service industry graveyard and be subsidized by slots too? Most of these racino subsidized tracks have an unappealing product and a purse structure that could never exist if not for the slot machine subsidy. Their presence is hurting the existence of neighboring tracks that operate on parimutuel waging alone pressuring them to acquire a slot machine subsidy as well. 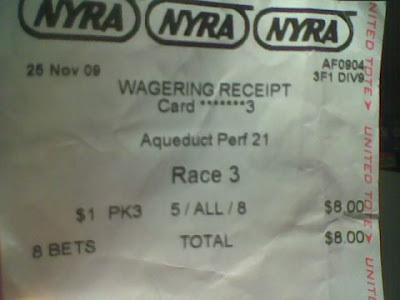 The sheer amount of racing not only reduces the appeal of the racino product but it also dilutes the appeal of tracks in neighboring jurisdictions siphoning stables and decimating competition thus neutralizing the appeal of the product. The expansion of gambling from parimutuel wagering and Las Vegas to slots machines in every region is another example of the enlightenment establishment not considering the unintended consequences of their meddling. The horse racing industry has not benefited from the increased gambling even when it enriches the purse structure temporarily it sets in motion the process that will eventually ruin the collective industry by market saturation and the loss of the fickle public as racing fans. In the past I have advocated a laissez faire approach to the current challenges of the horse racing industry. Call it an intellectual breakthrough but I now believe that the laissez faire approach is the road to ruin for racing. There are too many jurisdictions with too many local interests that have the game "drifting like a rudderless ship". At this point centralized influence and power would greatly help in providing "friendly persuasion" to the market forces affecting racing. The ship can not continue to drift and take on more product while the bulkhead of the ship takes on more water.